With the clock ticking down on the 2015 season, the Calgary Roughnecks (5-11) face the Minnesota Swarm (5-10) as they fight for their playoffs lives. Calgary is a half game behind the Vancouver Stealth with just two games left to play; Minnesota is three games behind the Buffalo Bandits with three to play and have no shot at the playoffs. Another loss by Calgary will likely eliminate them from the postseason. So tonight’s matchup at the Xcel Energy Center in Minny is critical for the Riggers. 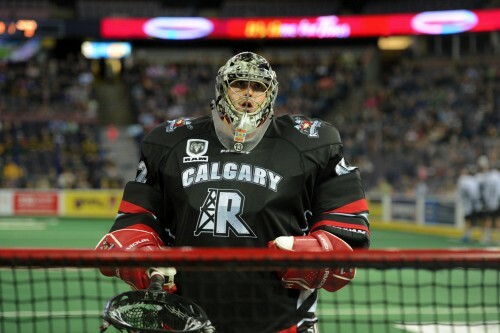 The Roughnecks split a two-game series last weekend against the Edmonton Rush, briefly passing the Stealth for third position in the NLL West Division before sliding back into fourth on Sunday. With only two games remaining on their schedule they are a whisker away from missing the playoffs for the first time since their inaugural season. It’s not all bad news in Calgary, however. On Saturday night forward Shawn Evans set the new single-season record for points in a season (117). With two more games left, Evans has a shot at extending that record to unreachable levels. Curtis Dickson has already reached career highs in goals (46) and assists (38). The Swarm have now lost two in a row, hitting rock bottom two weekends ago when the Rochester Knighthawks held them to two goals, a league record for fewest goals in a game. The effort was better last weekend when they scored nine times against the Bandits, but they still came up short in a game they had to have. Shayne Jackson is pacing the Swarm offense with 64 points. Jordan MacIntosh is having a very good year on the back end, scooping 148 loose balls, forcing 20 turnovers and still contributing 39 points to the offense. Calgary’s offense still has some explosive potential. With Evans, Dickson and last year’s league goal scoring leader Dane Dobbie in the mix, they can fill the net when they get on a roll. If the Swarm hope to win this game, they’ll have to contain those offensive threats. Calgary, on the other hand, needs to stay focussed and stay out of the penalty box, which is their Achilles Heel. If they can limit Minnesota’s power play opportunities, they should be in good shape. Game time is 8:00 pm ET in Minnesota.